Last week I took the Windsor Chair course from Alan Turner and Mario Rodriguez. As I started to use your travisher, not one, but everyone in the class asked if they could try it. Alan immediately went on-line and ordered at least one. And my other five classmates were going to do the same. It cut like a hot knife going through butter. My wife even liked it coming out of the box and said it was a work of art, something to keep on display!!!!!! You make a wonderful tool!!! Thanks. James, your travisher arrived last night. I just used it in my shop this past five minutes, wonderful! Thank you so much. Excellent work! The travisher I ordered came in on Saturday, it is very nice! I have been fighting a curved metal spokeshave and am glad I found your tools! She slices cherry like butter. Thank you so much for the wonderful tool. 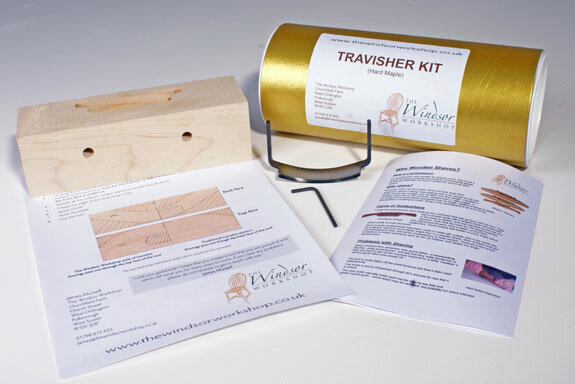 The travisher kit arrived this morning. A square block of maple looks a bit daunting at first sight but a couple of hours with a jigsaw a belt sander and an orbital sander, a coat of briwax and we were done. I used it on a knotty elm chair seat this afternoon, an excellent tool with a very sharp blade, thank you. Your travisher arrived yesterday. “Beautiful” would be an appropriate description. Smooth action, razor-sharp blade and thus effortless results. I used to allow at least a morning using my pullshave (£160) – it took but 25 minutes with your travisher. Money well spent I say. I would be honored to give a testimonial on your travisher I purchased. The quality is outstanding, holding an edge well. I purchased the kit and finished the travisher in my shop. I made it like the drawing included in the kit. I was able to make my first Windsor continuous arm chair; the seat came out great thanks to the travisher’s ability to smooth out the scorp’s rough marks. I expect many years of use from my travisher and would recommend it to anyone serious about making Windsors or chairs needing platform hollowing out. I performed extensive research before purchasing my travisher. Yours by far seems to be the highest value and works the best. I hope to stop in your shop someday and take some classes. It maybe a while since I live in Colorado, USA and the cost is a little more than I can afford right now. The Windsor is almost finished, I have carved out the arm for the continuous arm, and tomorrow it goes in the steamer. It is a riven piece of green white oak. I have tested another piece and it should work well. The jig for bending has had its last modification and is ready for bending. Thanks again for the commitment to quality making my travisher a valuable tool in my collection. Armed with your book and one of your travishers (what a wonderful tool) I have successfully completed the English comb back design from the book. By the way, I shaped the seat mainly using the travisher taking the block of dried elm from 2inches to half an inch at it’s thinnest and I only touched up the blade edge once on my felt wheel. I recently purchased one of your travishers for use in the Continuous Arm Windsor Chair Class I teach at the Melbourne Guild of Fine Woodworking, in Victoria, Australia. The item arrived promptly and well packaged with straight forward instructions on assembly of the nicely honed blade to the body. The travisher worked seamlessly and cut fine ribbons at angles on the seat that I had previously not achieved with similar tools. Suffice to say the Windsor Workshop Travisher was coveted by all students during the class, with one student buying his own immediately afterwards! A fine product James which would compliment any chair maker’s tool chest. I am an amateur woodworker with intermediate skills. I am presently engaged in making two Windsor chairs and have found this travisher to work extremely well. The seats are of pine. Further, I have been able to sharpen it quite satisfactorily using sheets of sandpaper wrapped on a dowel. This is an excellent tool. I recently had eight dining chairs to make out of beech. 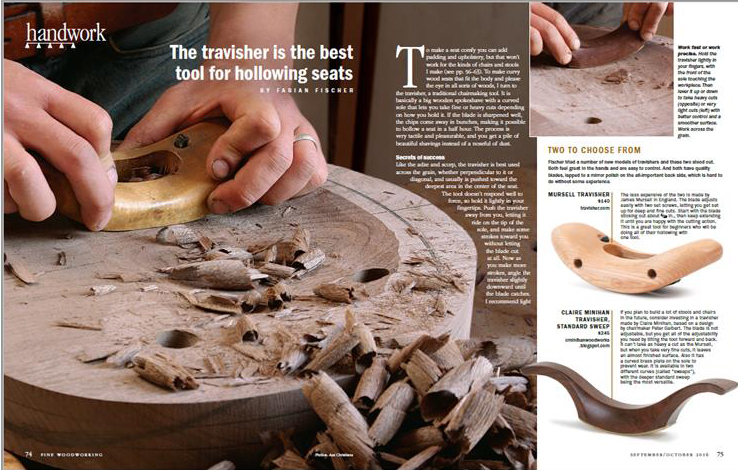 I had read about James Mursell’s Travisher in British Woodworking. In desperation to make progress I bought one, one of the best tool purchases I ever made! 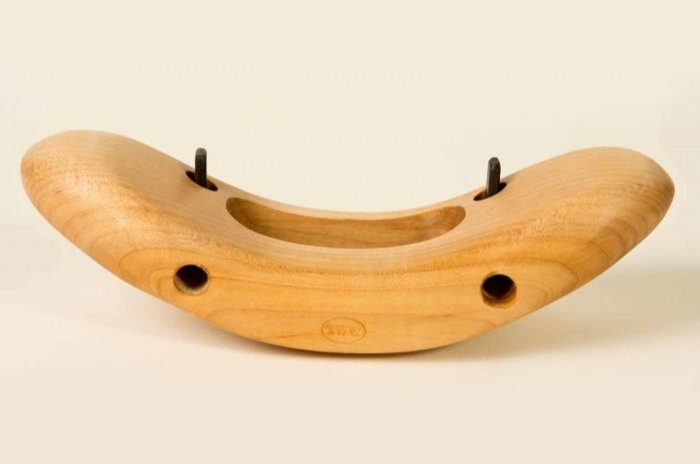 This Travisher’s ergonomic design sits so comfortably in your hand that it entices you to ‘have a go’. 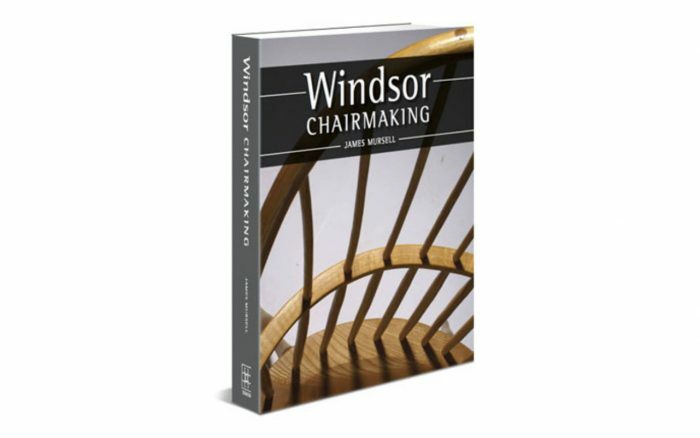 It is such a pleasure to use I could happily give up my woodturning career to spend my days planing seats for Windsor style chairs all day. 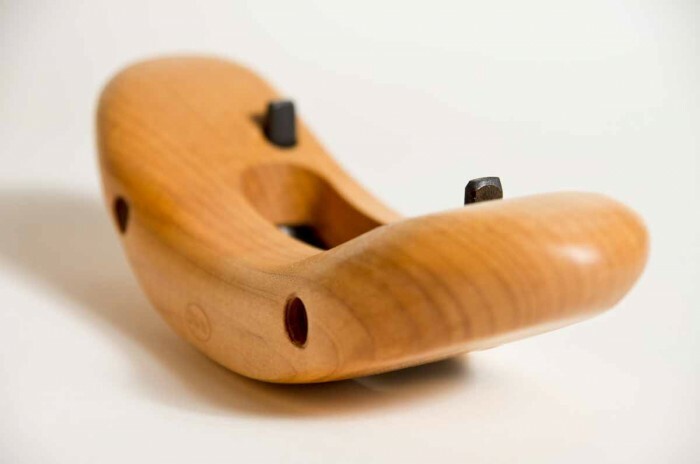 A superb tool with a razor sharp blade which cuts through the most difficult of timbers with ease.